We have a tradition of honoring a clinician each month who exemplifies one of the core values of our organization. This month we have chosen to recognize SLP Angela Arterberry for the way she has modeled our value of Provide Quality Service. Angela has been with The Hello Foundation since 2008. After serving hundreds of kids through Hello over years in local placements, she ventured into our Hello There model in 2012. She has provided service through this hybrid of onsite and tele-therapy to students in Alaska, preschoolers in eastern Oregon, and this year joined our team in Yakima, WA. In spite of challenges related to technology, staffing levels, and district culture, she has made the needs of students her highest priority. She forges meaningful connections with kids and families, and thinks creatively about connecting people with the resources they need to succeed. 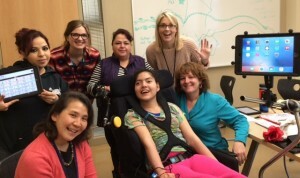 It brought smiles to our faces when we saw this picture of a non-verbal high school student whose Yakima team was able to acquire an iPad for her to use as a communication device. Angela played a critical role in navigating the funding and acquisition process with the family. She and her bilingual speech aide were able to work with assistive technology specialists and classroom staff to collect current data and build off the history of past trials. A big communication success for all involved! Angela, we value the High Quality Service you provide every day. Congratulations on being our May 2016 THF Clinician of the Month.